Our conference co-ordinators and catering department will ensure that your event is successful, enjoyable and memorable. 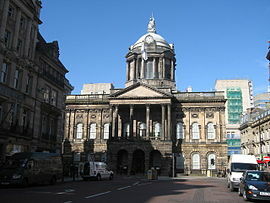 Liverpool Town Hall stands in High Street at its junction with Dale Street, Castle Street, and Water Street in Liverpool, Merseyside, England. It has been designated by English Heritage as a Grade I listed building, described in the National Heritage List for England as "one of the finest surviving 18th-century town halls".The Buildings of England series refers to its "magnificent scale", and considers it to be "probably the grandest ...suite of civic rooms in the country", and "an outstanding and complete example of late Georgian decoration". The ground floor contains the city's Council Chamber and a Hall of Remembrance for the Liverpool servicemen killed in the First World War. The upper floor consists of a suite of lavishly decorated rooms which are used for a variety of events and functions. Conducted tours of the building are arranged for the general public, and the hall is licensed for weddings.